Storing your Will is as important as writing one! We will arrange storage of your Will completely FREE. Why Have Your Will Stored? A Will is an extremely important legal document, it is your legal declaration about how you want your estate distributing after your death and who you want to deal with your affairs. If you have taken the trouble to write your Will, presumably you want to ensure it is found. Does it make to put it in a draw and keep your fingers crossed that when it’s needed someone will find it! Is the Will they find the most up to date one? Were the grandchildren short of drawing paper and your Will was the first thing to come to hand? We could go on, but hopefully you’ve got the point, by taking advantage of our storage facilities through Kings Court Trust Corporation you will always know that you will is secure and your executors will know where to find it. Even if you’re Will was written by someone else we’ll still arrange the storage FREE, but ask that next time you review your Will you bear us in mind AND that you’ll recommend us to your friends and family! 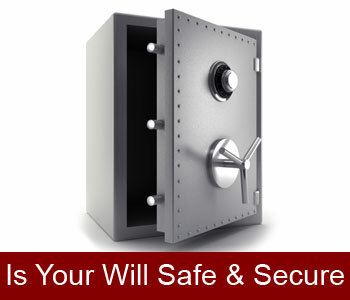 If you want to ensure your Will is safely stored free of charge then contact us now. If there is one place you should never, ever, keep an original Will, it is at home. If anything should happen to you in a house fire and your Will went up in smoke with you, then you haven't got a Will. If your Will is damaged in any way which could cast doubts as to the contents of the Will or raise questions as to why the damage was done, then the courts could throw your Will out as being invalid. You need to keep your Will in a place that's safe and secure. However, that place should not be so safe and secure that no one can find it when it's needed! You will receive confirmation of storage which includes information that you can pass onto your executors and/or loved ones to make reclaiming your Will as easy as possible. When your Executors need to access the documents, once they have provided a death certificate and proof of their identity, your documents will be returned to them - free of charge. If you would be interested in further information about Will storage please contact us now.